A Single Solution For Multiple Health Problems. Without Any Side Effects. 100% Natural and. Safe to Use. Ganotherapy takes a holistic approach to alternative complementary medicine. The underlying belief in Ganotherapy is that “Our Body is the Best Doctor” and “Prevention is better than cure”. 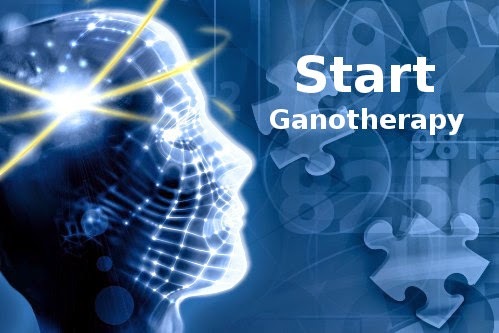 "Ganotherapy is a process of maintaining the healing system at an optimum level by supplementation with the highest quality Ganoderma Lucidum Fruiting Body and Mycelium extracts." The Human Body - the Best Doctor in the World. The word ´doctor´ here refers to the one on call inside our body. He works 24 hours a day to keep us healthy. When we catch a cold, he creates a river of mucus to carry the bacteria out of our body. When our cold settles in our chest and our lungs get congested, he makes us cough in order to rid our lungs of the congestion. When we get a fever, it is an indication that he is fighting off the infection. If we eat something that does not agree with our body, our doctor makes us vomit to rid our body of the culprit. When our doctor senses abnormal cells, he immediately begins to encapsulate the suspected cells and form a tumor. Even when a tiny splinter is detected, in less than a few hours, our doctor forces it out. As we sleep, our doctor continues to work, cleansing our body and getting us ready to fight another day. 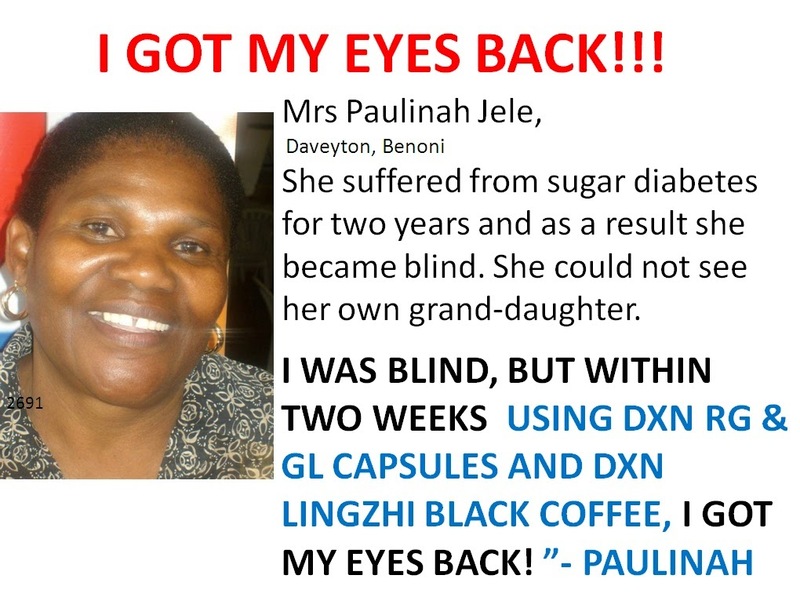 The following testimonials are taken from DXN's News letters, Internet articles and DXN's organized meetings. I am not a doctor and the advice below does not replace professional medical treatment in any way. But it can be worth a good try. I am along with my family taking DXN's RG & GL (contains 100% Reishi Ganoderma) daily to maintain good health and found useful. Please note that Ganotherapy differs person to person depends up on their body composition and toxins deposited in the body. Ganoderma does not have any side effects, however after using the product you might experience a reaction for a while. This is good sign and it means, the product is removing toxins from your body that are settled. After a few days, these reactions will diminish. For instance, if you suffer from Migraine headaches, your headache might even worse for a few days, but then it will disappear. If the reaction gets too severe, cut your doses in to half for a few days. Ganoderma does not cure any disease by itself, but it builds up your immune system and restores the body functions. Your body, when in good shape is the best doctor and can fight off any disease. The interesting factor is that RG/GL pairs are used here for all the diseases/ailments. This RG/GL is taken for all the diseases since they contain 100% Reishi Ganoderma which works on cell level. When cell is corrected, the organ, composition of cells is corrected and hence whole body, composition of organs is corrected. Some are using Ganozhi (tooth paste), Lingzhi Coffee, Cocozhi (health drink ) as a support which also contain (15-28 %) Reishi Ganoderma. 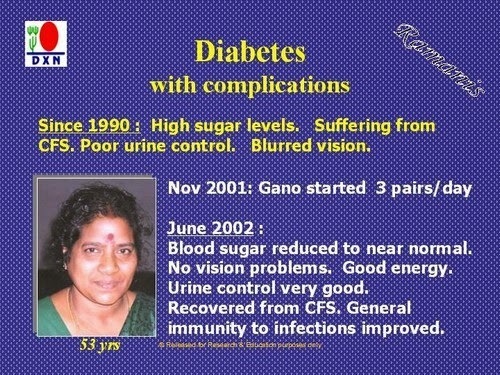 1) Mrs. Vasanthy Narasimhan - 50 years (Referred by Dr.Malathi Ramani) - Known diabetic for 13 years (Insulin dependent). Peripheral neuropathy. Also had General weakness, breathlessness, chronic fatigue syndrome. Advised to start on RG + GL as a supportive therapy from May 2000. First week 1 pair and 2nd week, 2 pairs. Continuous monitoring done. Same dosage and Lingzhi coffee was also advised to give energy. Patient started improving within 6 months of therapy. On 31.01.2001, she had impairment of blood circulation in both feet, and had frequent ulceration on her big toe, for which RG powder was advised to be applied after cleaning. Now general health improved. Blood sugar fluctuating between 130-150. Dosage of insulin reduced to 10 units. Cardiac system functioning good. No burning feet problem. Patient able to do all her work, by herself. Ulceration of the toes - healed completely. 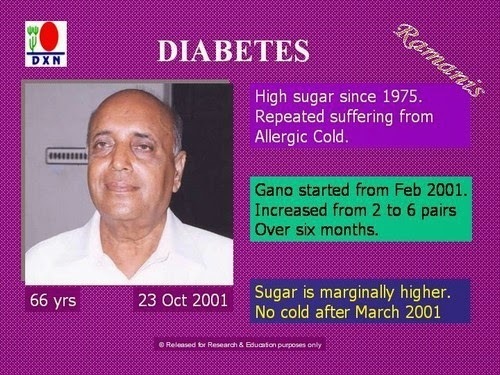 2) Mr. Shrinath Dinkar Surkund - Known diabetic for 12 years (Insulin dependant), Acidity, constipation, stress. Started consumption on 01.03.2002 (sugar fasting 248 post lunch 351) RG+GL pair 1 in the morning for 15 days + Morinzhi 2 times a day. After 15 days, 1 pair morning and 1 pair in the night + Morinzhi 2 times a day. Dose continued till Sept 2002. Insulin 84 units, Glynase Plain, Piozon 15, Glycomet 500. Sugar level fasting 98 post lunch 120 since April 2002. Insulin stopped since september 2002. Glynase plain + Glycomet 500 continued for precaution. 1 pair morning , morinzhi 2 times continued. Now symptoms controlled. Good relief from acidity, constipation, stress and can sleep well. 3) Mr. R.Ramasamy (82 years) - Chronic diabetic for the past 17 years and also affected by eczema (skin disease) for the past 7 years. After intake of 3 pairs for 2 months, sugar level came to normal (i.e from 250 to 120 in fasting),. My eczema problem totally vanished and feel very energetic. Presently continuing with 2 pairs for maintaining my good health. Remarks : I am very grateful to my son Mr.K.R.Velusamy and Mr.R.Radhakrishnan for advising me to use this product. 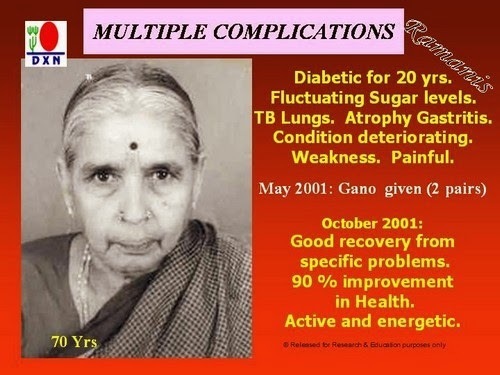 5) Mrs. M. Premavathy - Known diabetes for 15 years with minor kidney problem. Taken oral tablets for diabetes for 13 years. Have become insulin dependent from 1998 onwards. Severe back pain for several years. Started ganotherapy on 14.11.2001. 2 pairs of RG & GL and Morinzhi one teaspoon First three months sugar level has reduced from 325 mg to 250 for fasting and 450 to 325 for post prandial. Serum creatine reduced from 1.7 to 1.3 and strict diet control and daily walking. Sugar level reading as on 25.12.2002 -Fasting 160 mg, Post prandial - 180 mg, serum creating 1.01. Insulin dosage reduced and oral tables also reduced by 40%. Able to walk nearly 4 kms every day without any problems. Presently taking 2 pairs in the morning and 1 pair in the night. 6) Mrs. K.Rajamma, UAE - I was not fully convinced when it was introduced to me. As my mother was a diabetic patient for the last 30 years with insulin intake. I had started giving her 2 pairs as well as two table spoon of Morinzhi two times daily. With in few days itself, I could see some result in her overall health, and in the 7th month, the sugar level has started coming down. Today after 16 months, her sugar level is normal and she is not using insulin also. 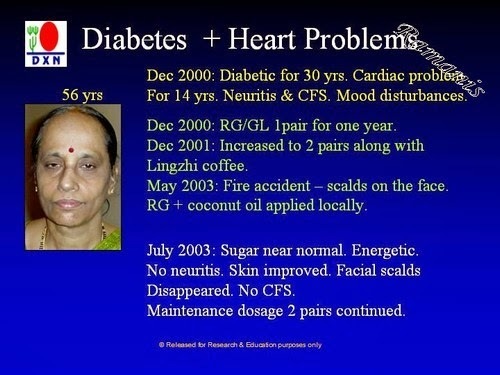 The same thing has happened to me also, I was diabetic patient for the last 20 years. When I started with Ganoderma my sugar level was 425 mg fasting. I have started with 2 pairs and Morinzhi two table spoon morning and evening and blank coffee also. Within 5 months my blood sugar level has come down to 90 to 100 mg - fasting. Both of us are now taking one spoon of mushroom powder daily as a maintenance dosage. As DXN has come to UAE, I am spending my leisure time to promote ganoderma with the sole intention of helping people by giving them this divine product. 7) Mr.D.Raveendran, 53 years - I was suffering from blood sugar for the last 17 years and high BP for the last 7 years. DXN mushroom powder was introduced to me in the month of Dec 2002. At that time, my blood sugar was 195 mg- fasting and BP 100-170. I ws using one spoon of mushroom powder daily. In the month of Feb 2003 when I checked my sugar level, I was surprised to see that it has come down to 147 mg fasting and similar effect was there in my BP level also, it came down to 90-150. More over my body pain due to improper blood circulation has also came down. 8) Sopiah Bt Hamidul - Malaysia - I was diagnosed with diabetes in March 2000. Subsequently, I injured my foot and it swelled up, got infected with pus and emitted an unpleasant odour, so I had to bandage it. Having gangrene in my foot was an unpleasant experience. I tried countless treatments, but to no avail. Finally, one of my toes was amputated and I gave up hope. I started consuming Ganoderma. A week passed, pus and a fluid discharge oozes from the gangrene and I felt dizziness and pain. With patience and support from family, I continued using the products. My foot slowly healed. There was no more pain and new tissues started to grow. After 2 months, the wound was fully healed. I wish to express my sincere thanks to those who recommended me Ganoderma products and supported me. Today, I can resume with my business activities freely. 9) Mrs. Marzianah Binti Abdul Malik - Malaysia - During the 7th month of my pregnancy, doctor had a blood test on me and confirmed that my blood sugar level was as high as 13.75mg/dl. I was seriously warned that the fetus in my womb may have to risk its life due to the abnormal high level of my blood sugar. Later, I learnt from Mr. Eddie Chan who is a health food speaker from DXN that the properties of DXN RG & GL and DXN Spirulina borne special effects for both the pregnant women and her fetus. Therefore, I immediately increased the intake of my dosage to 6 pairs for RG & GL daily and 20 tablets for DXN Spirulina daily and of course I also consumed 2 liters of DXN EWS energy water daily.One week later, I turned up by appointment for the next blood test and I was informed by the doctor that my blood sugar level had returned to normal at 4.87mg/dl. Finally, I had my normal delivery on 6 February 2003. Thank God that my newly born baby was very health and her skin was tender and beautiful. I wish to take this opportunity to express my most sincere thanks to DXN Marketing Sdn Bhd. for producing such high quality and effective health foods like RG & GL and Spirulina to all DXN distributors. 10) Mrs. Ninfa Rios - Los Angeles, CA - I have been taking 1 pair a day of the Ganoderma capsules for 4 weeks now. 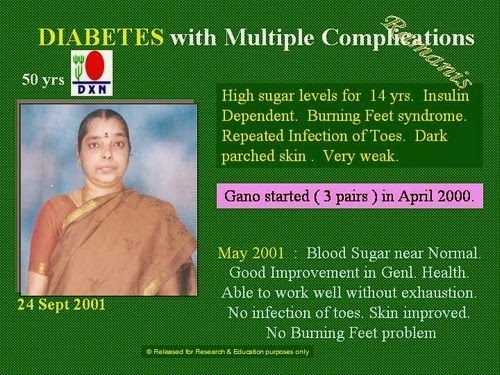 My blood sugar level history is as follows: Before taking the Ganoderma capsules. After taking the Ganoderma capsules: 1st week: 252; 2nd week: 187; 3rd week: 153 and 4th week: 137. This the first time my blood sugar went down to 137 in 13 years ! I’m so excited about the Ganoderma products. Join FREE save 25% and Get the Ganotherapy booklet for free. How Acid Overload Can Make You Sick! This blog is registered and operated by an Independent Party of DXN. DXN does not endorse any information on this site nor does DXN assume any civil and/or criminal liabilities arising out of this website. The information relating to DXN Products and/or DXN itself on this site are not intended to diagnose, treat, cure, or prevent any disease or replace medical advice or treatment. 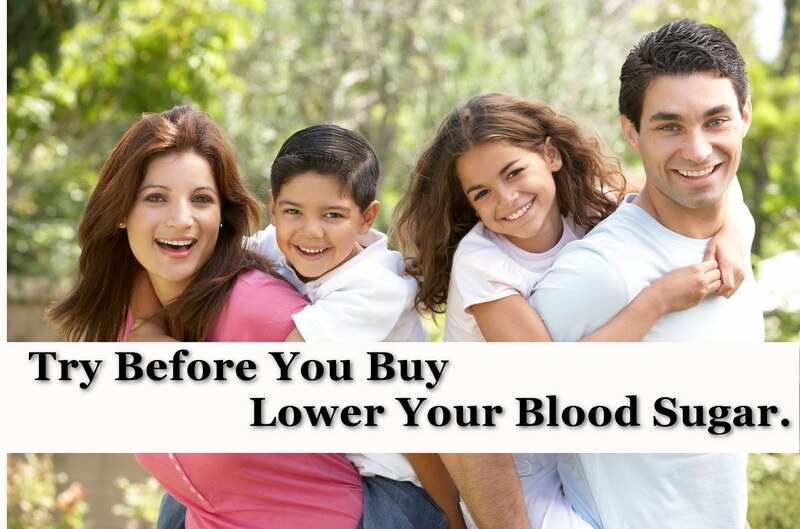 The information presented on this website is for informational purposes only, and is not intended as a medical advice or a substitute for a physician's consultation and/or examination.